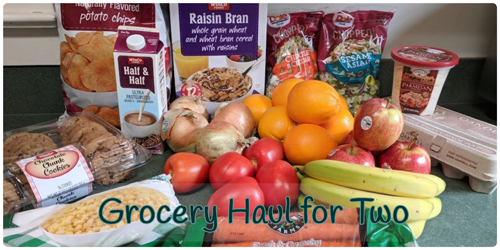 It's time for Friday's grocery haul! I didn't need a ton of things this week. In fact right now my freezer is completely full so I have a ban on buying more until I use up much of what I have. I need to do another freezer inventory so I can plan my meals around that. 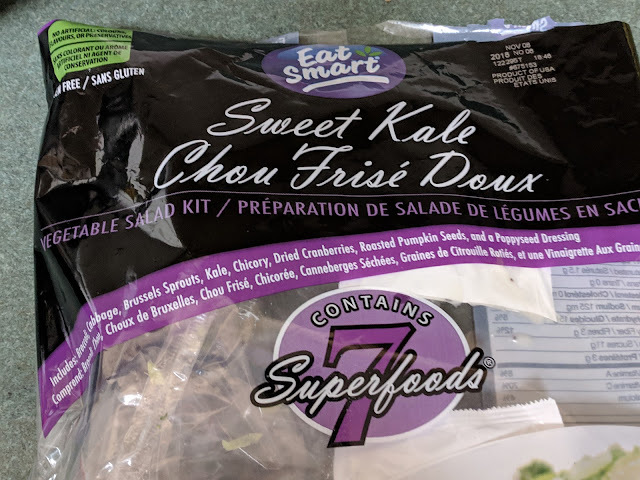 I still have spinach, kale, and romaine lettuce. 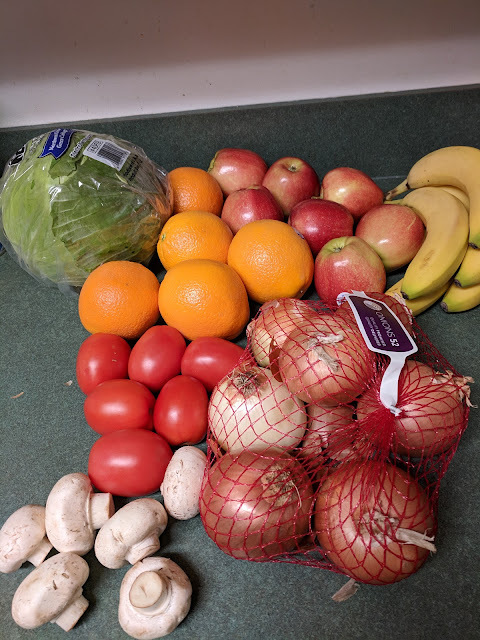 All I needed was cabbage, tomatoes mushrooms and onions. And I picked up our weekly supply of fruit too. 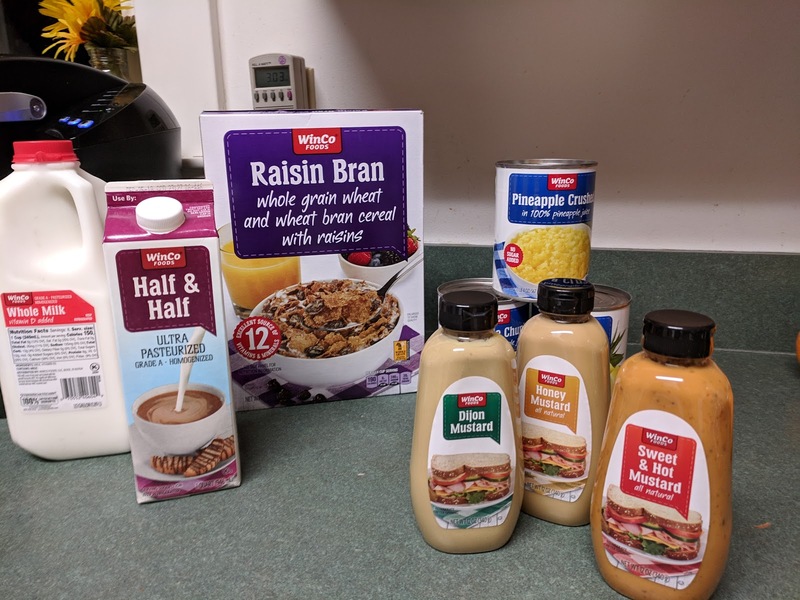 I didn't realize until later looking at the pictures I took that the canned pineapple ended up hidden behind the mustard. But there are 3 cans of pineapple back there. The mustard was on sale so I picked up extra for the pantry. The rest was raisin bran, half & half, and milk. I bought a few things in the bulk section. After cleaning my pantry I realized I needed to stock up on dried beans and peas. 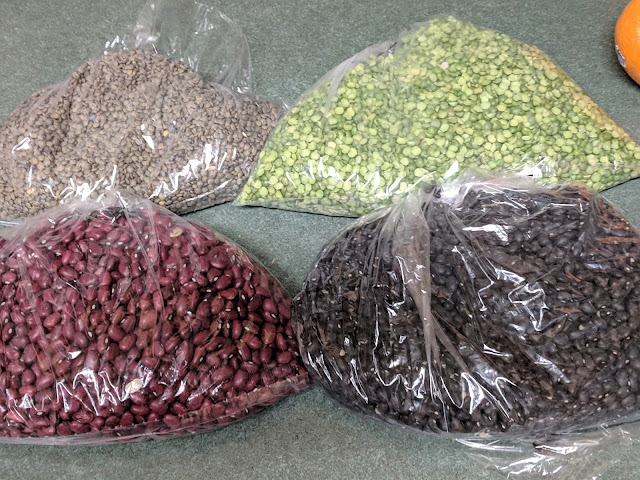 Top row (left to right), green lentils, split peas, bottom row, red beans, black beans. They are now neatly sitting on my pantry shelves :). Those darn samples.. what can I say. They were sampling that pizza and it was so good! (either that or I was really hungry! Ha, ha!! :). So I bought a box. I now have a lot of pizza in my freezer. When I do make it I'll let you know if I still think it was as good as it tasted when sampled. Hiding in the back is a box of green tea bags. I picked up some mini peppers and a bagged salad kit. 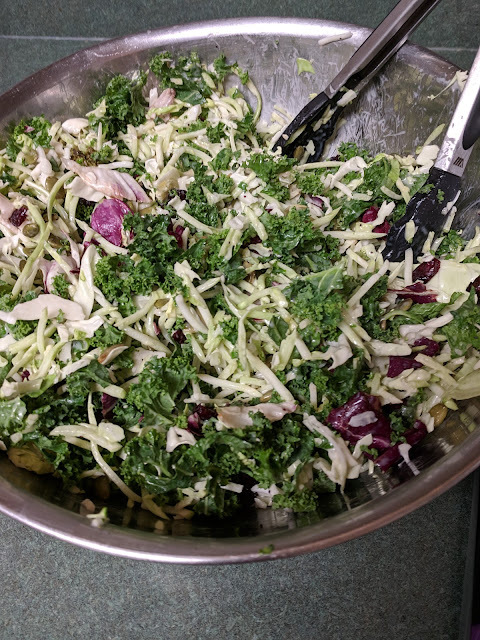 This salad kit is one of my most favorite. It was getting late and I knew we still needed to eat when we got home and was losing my energy to cook or assemble anything when I got home so the kit was the perfect answer. I bought another 2 pack of Kings Hawaiian rolls. I had some in the freezer already but wanted to serve those with dinner when we got home so I picked up more. 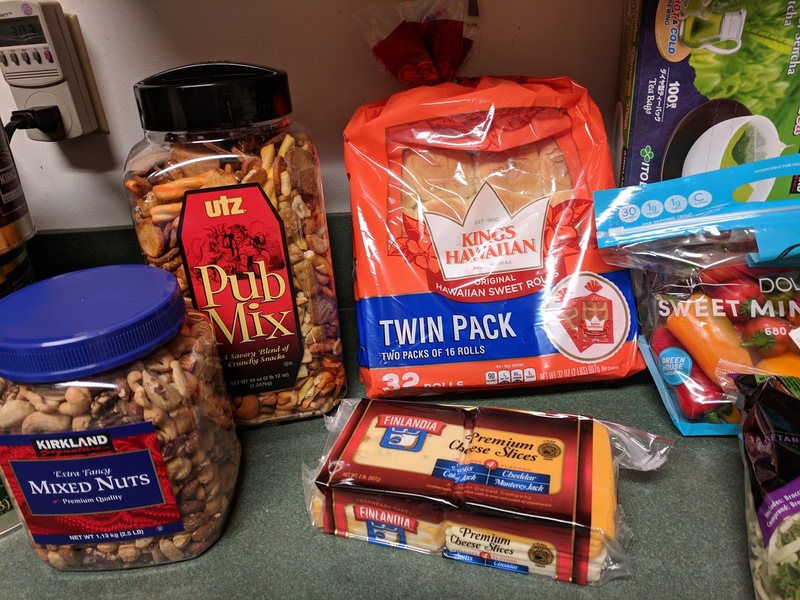 I purchased a package of cheese slices and restocked my hubby's pub mix and our mixed nuts. I needed coffee again, 1 regular & 1 decaf. 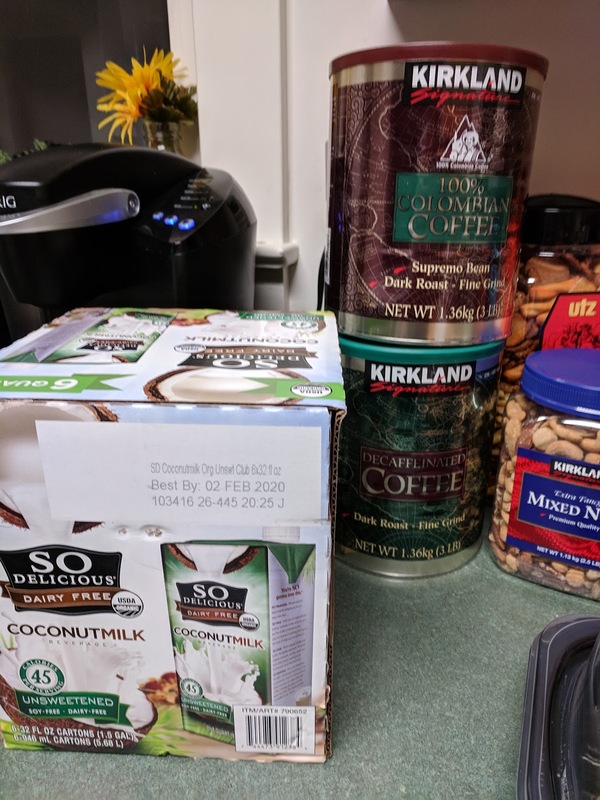 I saw that Costco had a 6 pack of quarts of coconut milk for less than Winco. So I picked up one of those as well. 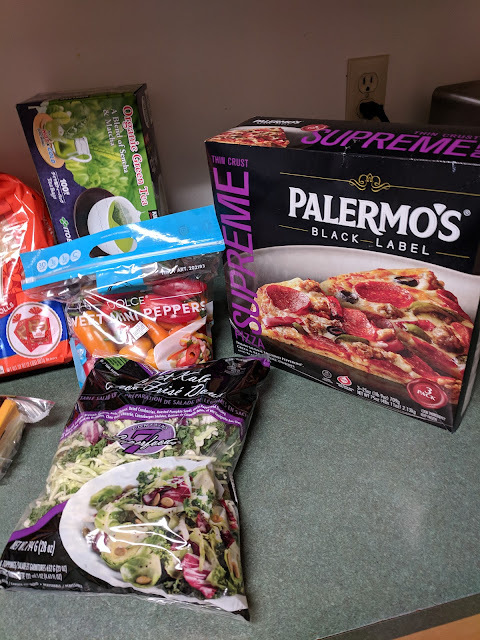 My final purchase was the rest of our dinner for that night. 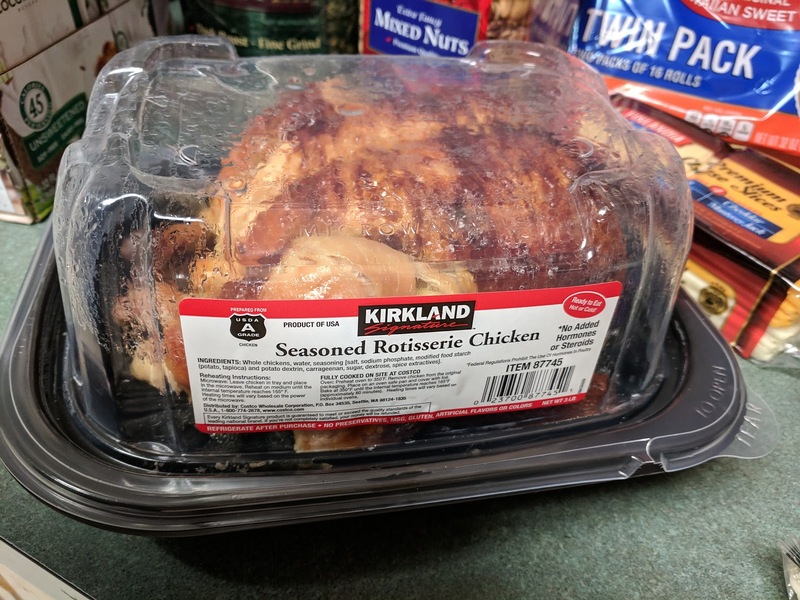 A rotisserie chicken. Costco's are by far the best ones around here, in my opinion. They are $4.99 and the chickens are always huge. It fed us that night and I have plans for the rest of the chicken next week. I am going to debone and freeze the meat and the bones. 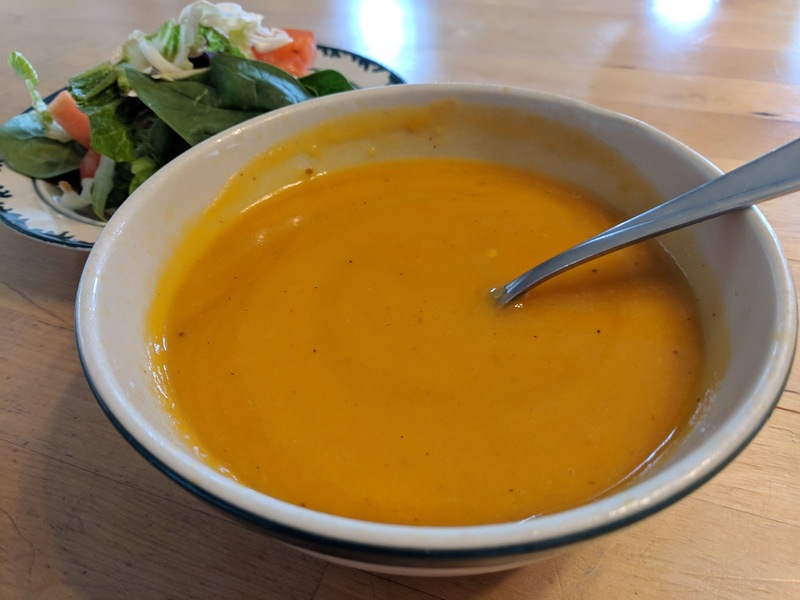 I made this soup last week and it was wonderful. It made a great lunch and I served it with one of our dinners as a side dish. For this recipe you'll need to peel and cut up the squash so you can roast it before making the soup. The roasted flavor adds so much to the soup. The one thing that is a pain about winter squash is peeling them. The skin is so hard. I found a trick to make this job super easy. Drizzle the squash with olive oil and sprinkle with salt and pepper. Toss it all to coat and put it into a baking pan. You'll also need to roast the onion and the garlic. Chop the onion and drizzle with olive oil and sprinkle with salt and pepper. The recipe calls for a whole head of garlic. If this is more garlic than you want, feel free to reduce to your own desire. The simplest way to roast garlic and not have to peel each single clove is to cut the tops off the cloves so you can see them. Drizzle a small amount of oil over the top and set in your baking dish. When the roast time is up the garlic will easily pop right out of the skins. Put the onions and the garlic in another smaller baking dish. I do them separately from the squash because they typically don't take as long to roast. Roast the veggies at 400 degrees for 20 to 30 minutes or until nicely browned, stirring occasionally.. When the veggies are done put them all in a soup pot and use a hand mixer to make them smooth. Add water, about a cup at a time, continuing to mix with the hand mixer. Continue adding water until the soup is your desired consistency. My preference is about the consistency of tomato soup. This took about 3 1/2 to 4 cups of water. Taste and add more salt and pepper according to your own desire. 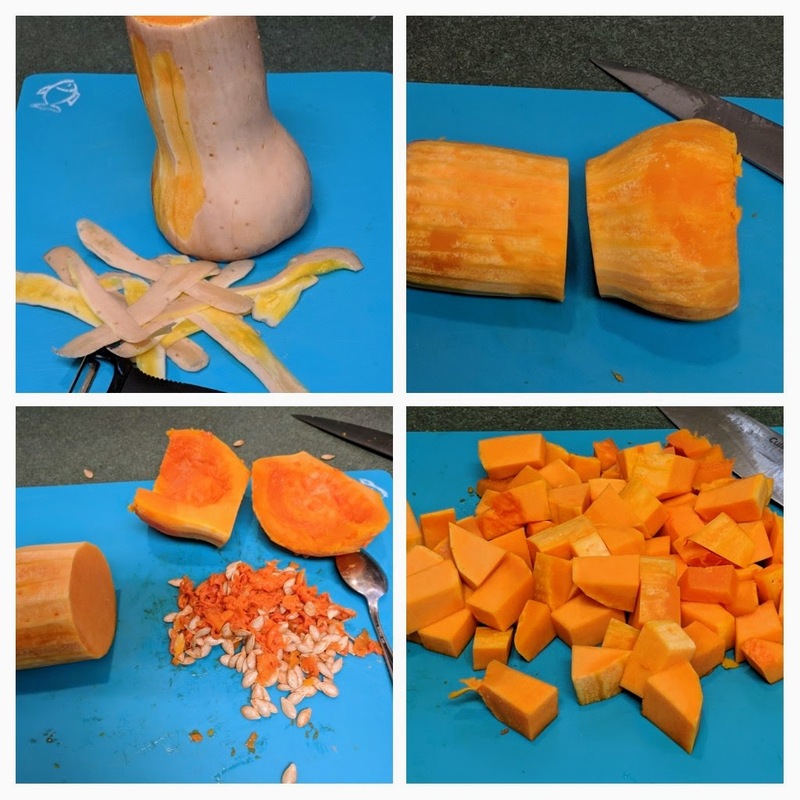 Peel, remove seeds and cut up butternut squash into small pieces. Put squash pieces in a bowl and drizzle with 1 tablespoon of olive oil. Salt and pepper to your liking. Toss so the squash is coated with oil. Spray a baking pan (or cookie sheet) with non stick spray or use parchment paper. 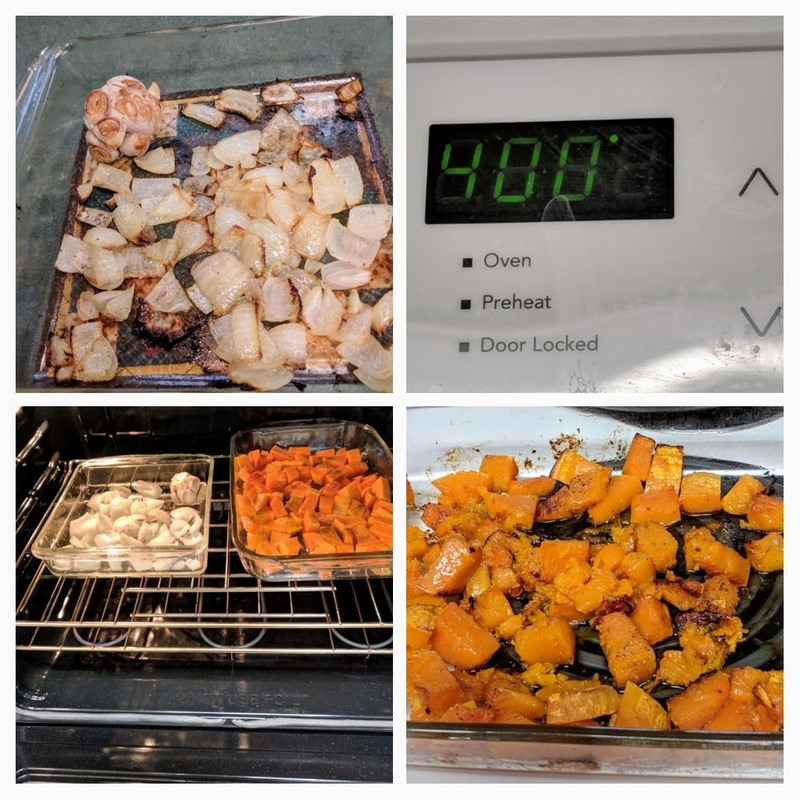 Lay out the squash pieces and put in a 400 degree oven. Repeat same process with onion and garlic, putting them on another baking pan. Put them in the oven with the squash. I do them separately because the onion and garlic can cook faster. Roast the veggies for 40 to 50 minutes, stirring occasionally during the cooking time. 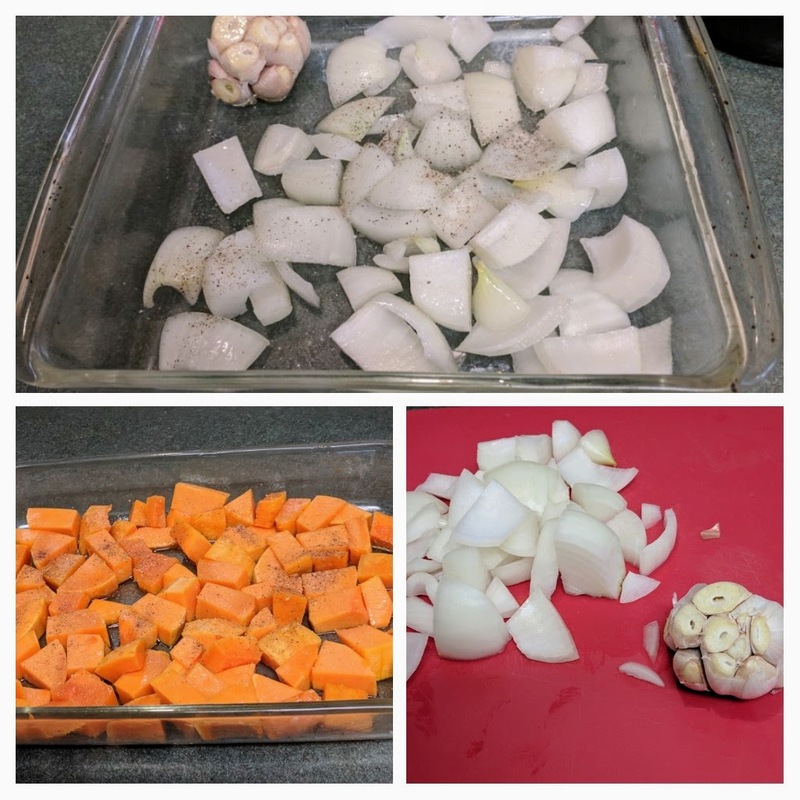 Remove the onion and garlic when they are roasted and brown. 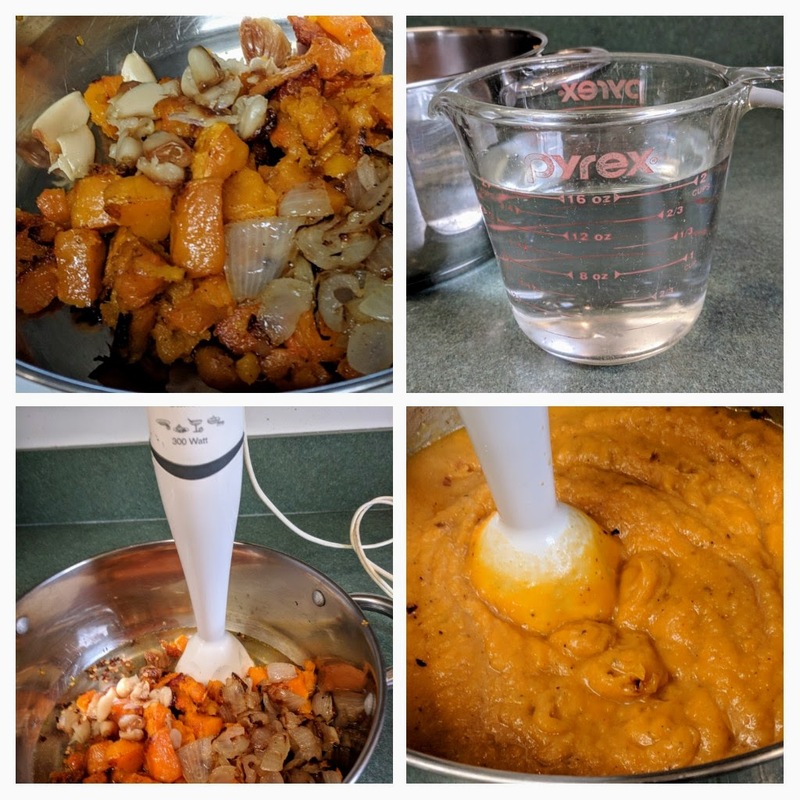 Let the squash continue cooking until it is roasted and brown. When the veggies have finished roasting put them in a 4 quart soup pot. Add the red pepper flakes. Using a hand blender, blend them and add the water or veggie broth a cup at a time until the soup is your desired thickness. I aim for the thickness of tomato soup. Taste and add more salt if needed. Enjoy with french bread and a big green salad. Looks like your squash is all over your stove burner! Did you have an oopsie? I'm going to try this recipe as it looks so good. Hi Alice! No, the squash was in a glass dish and I set it on the stove burner when I took it out of the oven.. then took the picture.. but you're right.. it does look like that 😁😀. Hope you enjoy the soup if you try it. Quick question: I notice that you purchase the Utz Pub Mix at Costco frequently for your husband's lunches. I have seen it at Costco but never purchased or sampled it. Does it taste very salty? I don't care much for really salty things. It looks good and I've often thought of buying a canister. I'd appreciate you or your husband's opinion on it. To me it doesn't taste overly salty. Potato chips taste more salty than the Pub Mix. I'll ask him what he thinks as well. Just Me, I asked him and he said he felt like they are medium in salty taste. 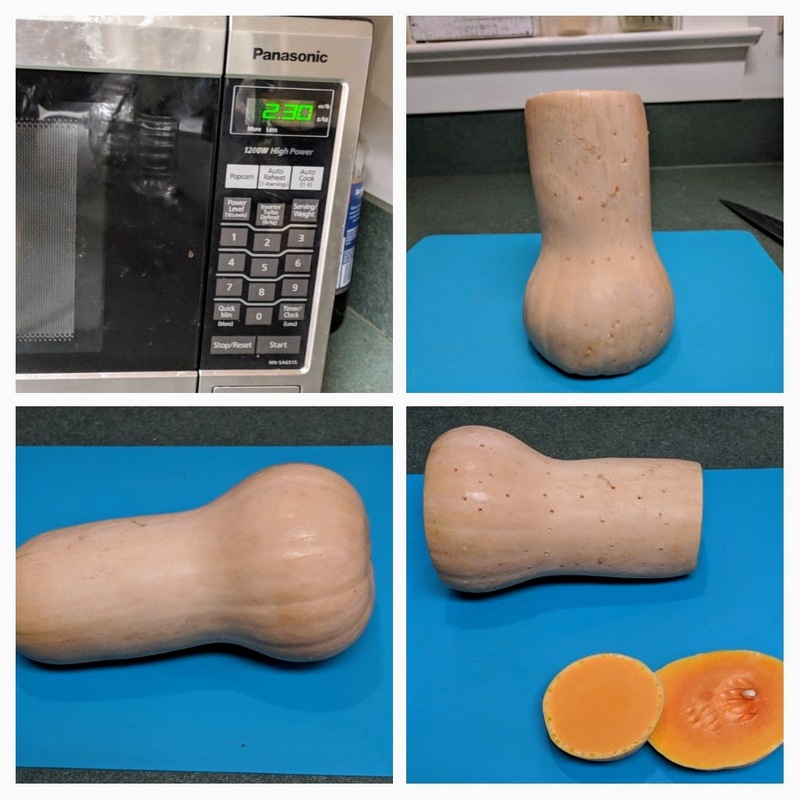 I have always hated peeling butternut - thank you for the tip!